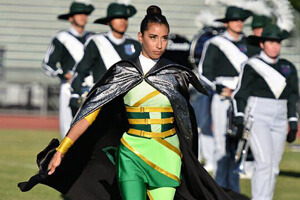 Open Class: Brass: Blue Devils B (15.1), July 7, Sacramento, CA Percussion: Blue Devils B (15.5), July 8, Pleasant Hill, CA Color Guard: TIE — Blue Devils B (15.5), July 7, Sacramento, CA and Vanguard Cadets (15.5), July 8, Pleasant Hill, CA View all scores and recaps. Storylines to watch • Carolina Crown this past week eclipsed its own record for consecutive wins. As a World Class corps, Crown has twice achieved a 10-show winning streak both in 2009 and in 2010. Since taking third place at the season opener in Akron, Ohio on June 16, Crown hasn't lost. The corps' most recent victory on July 8 in Chambersburg, Pa., puts its streak at 12. • Following a similar tour schedule to Carolina Crown, the Cadets have been keeping things relatively close to the South Carolina corps, scoring within three tenths at three straight shows from June 23-26. Crown has since increased that margin to 1.2 (July 3, Bristol, RI), 1.65 (July 6, Quincy, MA) and 0.95 (July 8, Chambersburg, PA). • It hasn't been since Aug. 10, 1986 in Sioux City, Iowa that Spirit of Atlanta has scored ahead of the Cavaliers. On July 7 in Kalamazoo, Mich. Spirit took third place to the Cavaliers' fourth place, outscoring the Green Machine 74.15 to 73.55. Looking back in time, after that Aug. 10 victory in Sioux City, a week later at the 1986 DCI World Championships in Madison, Wis., the Cavaliers would end the season as the victors, besting Spirit by 1.6 points in the Finals. 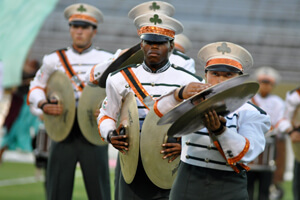 Spirit of Atlanta will next face the Cavaliers on the 2012 DCI Tour on July 9 in Centerville, Ohio. • Just a handful of corps have eclipsed the 80 point mark to date. Joining the Blue Devils past that milestone this week were Carolina Crown and the Cadets who both achieved the feat July 3 in Bristol, R.I. • Teal Sound eked a victory over the Jersey Surf on July 3 in Bristol, R.I., outscoring the New Jersey corps by a tenth of a point. Surf leads the head-to-head matchups between the corps 3 to 1, most recently outscoring Teal by 1.4 points on July 7 in Jackson, N.J. • After an almost two-week break from competition, Blue Devils B returned to the 2012 DCI Tour in fine form, scoring 74.65 on July 7 in Sacramento, Calif., an improvement of almost 6 points over the corps' last recorded score on June 26. 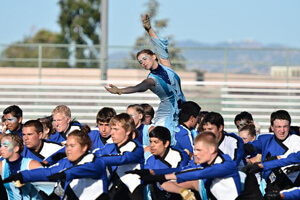 BDB would put up another big number on July 8 Pleasant Hill, Calif., earning a 77.15.